When I saw on Instagram that the Rockstar OTSFF Yamaha guys were out at the Gopher Dunes Arenacross/Supercross practice track on Tuesday, I quickly gave team manager, Steve Simms, and Gopher Dunes owner, Derek Schuster, a call to see if they’d be back on Wednesday. Fortunately, the heavy rain we’ve gotten lately meant they really couldn’t ride the track and they’d be back in action again on Wednesday around noon. “I’ll be there,” I said. 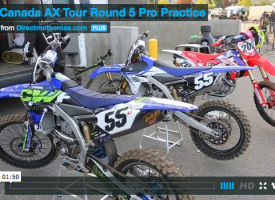 They were getting ready for the Montreal Supercross this Saturday, and I was keen to get a look at Phil Nicoletti on the bike. Also riding were Dillan Epstein, Colton Facciotti, Dylan Wright, and Marco Cannella. Nicoletti has signed a 2-year deal with the team that will see him race the Montreal SX this week, and the rest of the Rockstar Triple Crown Supercross Series and then all of the 2019/2020 seasons. Here are a few photos from Wednesday at the track. Phil has yet to be kitted out in all his new gear, but I couldn’t let that stop me from taking his photo and shooting some video. Derek Schuster was on site checking out his two riders and making sure everyone had everything they needed. Steve Simms making sure Phil and Dillan were set up. They tried a couple different engine maps, too. Phil ready to hit the track. Phil raced at Walton way back in 2007 and finished 2-DNF. Dylan Wright has never raced inside a stadium, he said, so this weekend should be pretty cool for him. Hitting the take-off over the finish line jump. The ground was still a little soft, so you had to look well ahead and pick your line. Dylan got a little out of shape in the whoops and went over the bars. I told him I didn’t pull the trigger and take the photos of it, but I didn’t say I wouldn’t mention it! He was fine, just pissed off. We sat down with Phil and did some “Tailgating” that you can check out here on the site. Steve doing his best PUC worker impression. Dillan said he’s shooting for a good finish in Montreal this week. Marco and his mom, Sally, are also heading for their first stadium race this week. I saw the two flags, so I went for the shot. Dylan and Colton talking about the track. The OTSFF pits for the afternoon. Phil has raced the Montreal SX before. All eyes were on Marco for this session. I’m always curious if a parent is worried watching or looking for places their kid could go faster? It’s probably a bit of both. You’ve really got to wonder how many more times we’ll get to see this. Dylan Wright should be one to watch this week. Alex Martin will be there on a 250…in the 450 class. Phil said he won’t try to get in the way of the $100K points battle between the top guys, but his presence could help swing the points in one direction or another. Marco enjoying his locks after I told him hair genes are supposed to come from the mother’s side of the family. He got lucky! Pretty cool experience for a rookie to practice with these guys. We’re all taking turns predicting what the GDR team will look like for 2019. Guesses? They did a whole bunch of practice starts. Dylan over the finish line booter. And Dillan over the finish line booter. Marco spun a few laps on the motocross track to get warmed up. Here are a few shots where I tried to get…artsy. And that will do it until we get to Montreal. Good luck everyone. We’ll let Dillan say it with his new profile pic. See you at the races..